Safety Recalls, Original; see modified release: SCUBAPRO/UWATEC Dive Computer Consoles Recalled by Johnson Outdoors Inc.
WASHINGTON, D.C. - In cooperation with the U.S. Consumer Product Safety Commission (CPSC), Johnson Outdoors Inc., of Racine, Wis., is voluntarily recalling about 1,700 SCUBAPRO/UWATEC dive computer consoles. The U-Line submersible pressure gauge that is part of the dive consoles can malfunction and display inaccurate pressure readings. Divers using the consoles could fail to decompress properly during a dive, causing decompression sickness. CPSC and Johnson Outdoors Inc. have received four reports of the pressure gauge malfunctioning. No injuries have been reported. 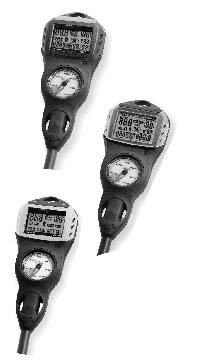 Aquatic sports, sporting goods and dive shops nationwide sold these gauges from January 2002 through May 2002 for between $500 and $700. Consumers should stop using the recalled consoles immediately and contact SCUBAPRO/UWATEC at (800) 382-2211 between 8 a.m. and 4:30 p.m. PT Monday through Friday. Consumers should send the console to SCUBAPRO/UWATEC, Attention: Tech Services/U-Line PG 1166 Fesler Street, El Cajon, CA 92020, to receive a replacement pressure gauge.